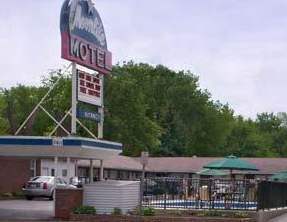 The Moonlite Motel at the Falls, a Magnuson Hotels affiliate, is located in Niagara Falls, NY with easy access to I-190. This motel is located just minutes from Niagara Falls, the Maid of Mist Boat Ride, Niagara University, Mount Saint Marys, Niagara Falls International Airport, Buffalo General Hospital, the Outlets of Niagara, Lewiston Museum, and the Seneca Niagara Casino. Free shuttle service to Niagara Falls and the Casino is offered to all guests from June to September. Each of the 21 guestrooms features a queen sized bed, colour television, air conditioning, iron, ironing board, refrigerator, free newspaper, and free local calls. This Niagara Falls Motel offers smoking and non-smoking rooms for all guests, free continental breakfast, free parking and a heated outdoor pool.